Tri-Peaks Solitaire is a variation of Pyramid Golf that, in it's turn, is a combination of two well-known solitaires Pyramid and Golf Solitaire. This game is also known as Three Peaks, Three Towers and Tri-Towers. It was invented in 1989 by Robert Hogue. The game has quickly become extremely popular around the world. Tri-Peaks has very interesting scoring system that encourages player to make long runs of consecutive cards played to the foundation. Tri-Peaks is a game of elimination. Eighteen cards are dealt in the form of three overlapping Peaks (pyramids). The object of the game is to eliminate all the cards in ascending or descending order regardless of suit from the tableau to a single foundation. Only fully exposed cards of tableau may be played on the foundation. When you are out of moves you can deal another card from the stock to the foundation and continue eliminating cards from the tableau. 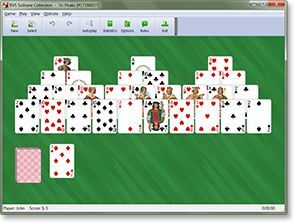 BVS Solitaire Collection 8.2 for Windows XP/7/8/10 is an award-winning collection of 530 solitaire card games. It includes Tri-Peaks Solitaire and 10 similar games. Buy BVS Solitaire Collection now to play 530 solitaire games (including Tri-Peaks Solitaire). You will receive your registration code within a few minutes. You will also get Plus Pack with excellent additional card sets, card backs and backgrounds. Only $19.95 USD.